If you knew a secret — the secret answer to receiving untold blessing in your life and marriage — what would you do with it? What if it were a simple secret, clearly explained and graphically demonstrated, a secret you had the ability to act upon? Would it be worth any sacrifice in order to experience the results…blessing, happiness, emotional health, well-being, peace, harmony? Or would you hide the secret away somewhere and settle for mediocrity afterall? We want you to come face to face with these questions, because it is a revolutionary secret! It’s not our secret. We didn’t invent it, or even discover it. It is in God’s Word — plain and simple for all to see. Specifically, it is in John, chapter 13. You know this story. You’ve probably heard it a hundred times. But listen for the 101st time, and let it change your life and marriage. It was time for the Passover celebration, so Jesus gathered with His disciples in a rented upper room for dinner. Later that night, He would be arrested, so this was a very important time of teaching the disciples the truths they needed to hear before He was taken away to be crucified. He loved these men, and wanted them to understand just how deep His love really was. There were no servants in attendance, so when the men arrived for dinner, no one performed the customary courtesy of the washing of feet. And not one of the disciples offered to do such a menial and humiliating task. Jesus sat there, thinking about how much He loved these rough men gathered around Him. He also thought about how …the Father had put all things under his power, and that he had come from God and was returning to God (Verse 3). Jesus knew exactly who He was, He knew where He came from, and He knew where He was going, …so, verse 4 continues, he got up from the meal, took off his outer clothing, and wrapped a towel around his waist…and began to wash his disciples’ feet…. Jesus could wash the disciples’ feet because He knew who He was. He didn’t have to prove who he was; nor demand the respect He deserved. He knew who He was, so He could wash feet. Do you know who you are? If you are a Christian, then you are a child of Almighty God, Maker of heaven and earth. The God of the universe loves you personally and unconditionally and has called you His child. That’s who you are. When you accept this truth, you will be free to wash feet. Jesus knew where He came from and where He was going, so He could wash feet. Do you know where you come from and where you are going? You came from God. He created you and knit you together in your mother’s womb (Psalm 139:13). He has known and loved you from all eternity; and you are going to live with Him for all eternity. When you accept and believe these truths, you will be free to wash feet. 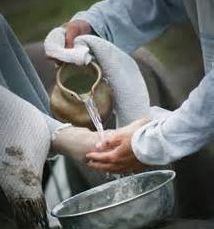 When Jesus finished washing all the disciples’ feet, He asked them, Do you understand what I have done for you? (verse 12) I have set you an example that you should do as I have done for you (verse 15)….Now that you know these things, you will be blessed if you do them (verse 17). It is very important we understand what He was teaching us by His own example, so that we can follow in His steps. He was showing us how to love by way of the towel. Love is servanthood, love is humility, love is putting others’ needs before our own. Some of you are thinking, “How can I love my mate like that? I don’t have the power to love like that.” Of course you don’t. But God does! Paul prays in Ephesians 1:19 that we would understand the incomparably great power God has for us who believe. Because the Holy Spirit lives inside us, we have the very power that raised Christ from the dead residing in us as well. That should be enough power to enable you to love your mate like this, shouldn’t it? Some may be thinking, “I can’t love my mate like that. He (or she) doesn’t deserve that kind of love.” The truth is, nobody deserves this kind of love. The disciples certainly didn’t deserve love like that, but Jesus washed their feet anyway — even Judas’s. And then He said plainly that we will be blessed, not if we know these things, but if we do them. Jesus loved His disciples with a servant’s heart and with a servant’s actions. Philippians, chapter 2 says He took on the very nature of a servant. To have a servant’s nature means we focus on our mate’s needs, instead of focusing on our own. That’s not our natural tendency, is it? Our tendency is to be self-absorbed. “My mate should treat me better.” “What am I getting out of this relationship?” “I deserve better.” “Why should I do this for you? You don’t do anything for me.” Being self-absorbed makes us miserable, and everyone around us miserable as well, because when our focus is “me, me me,” we’ll never get enough. We’ll never get enough love or respect or appreciation. “Me-ology” is a trick of Satan to make you an unhappy, stunted, miserable husband or wife! Jesus says the secret to happiness is: Now that you know these things, you will be blessed if you do them (verse 17). To bless means “to cause to prosper, to make happy, to bestow blessings on.” (Expository Dictionary of New Testament Words, W.E. Vine) You want to be happy? Then wash feet. Servanthood is the path to blessing. Focusing on your mate instead of yourself is the way to happiness. That is what Jesus says! Dr. Ed Wheat tells how he discovered this in his book Love-Life for Every Married Couple. “Many of the principles put forth in this book were tested and proven in a two-year period of marital stress at the beginning of my Christian life when my lovely wife Gaye and our three young daughters were unresponsive both to the gospel and to me….I learned that it was my responsibility to love my wife the way Christ loved me. Many times I did not feel like loving her, for rejection, even quiet, courteous rejection, is hard to handle. But I did it out of obedience to God. I found that as I put the principles of the Bible into practice and as I learned how to really love my wife, this became pleasure as well as responsibility. Obedience took on the bright colors of joy! As I slowly became the husband God had designed me to be, my wife began to respond with love just as God had planned and promised.” Ed and Gaye Wheat proved what Jesus said about servanthood being the path to joy! What an incredible statement! God the Father watches the way you treat the one He sent you — your husband or wife — and He considers your attitude and actions toward your mate as being expressed toward His Son and Himself. “Oh, wait a minute,” you protest, “I don’t think God sent me my mate. I was out of God’s will when I got married, so this doesn’t apply to me. God doesn’t expect me to accept my mate like that.” Dear one, even if you weren’t a Christian or were not living for the Lord when you got married, that person to whom you are married is now God-sent into your life. And Jesus’ profound statement remains. The kind of love Jesus is talking about expands our notions of servanthood beyond simply being other-focused, all the way to accepting our mates like we accept the Lord Himself. This is a dimension of love few of us understand. We talk about Agape love — God’s kind of love — but then try to practice it while putting conditions on it. “If you are loving to me, then I’ll be loving to you.” But Agape love — the kind of love Jesus graphically demonstrates for us in John 13 — is deeper and wider than that. Agape love is how God feels about His Son. Do you feel about your mate the way God feels about His Son? Oliver Cromwell, who ruled England during the seventeenth century, once decreed that a certain young man should be executed at the ringing of curfew. The young man’s fiancée pleaded with Cromwell for his life; but Cromwell would not change his mind. “The young man you love will die at the ringing of curfew,” he declared. The old and completely deaf sexton went up to the church that night to ring curfew. Unknown to him, the young lady who loved the condemned man had climbed up inside the great bell and was hanging on for dear life to the clapper. So every time the sexton pulled the bell rope, thinking it was ringing loud and clear, her body was hitting against one side of the bell and then the other without a note being struck. This is the secret to God’s blessing in your life and marriage — loving your mate with sacrificial love. Jesus showed you how this love means being a servant and focusing on your mate’s needs instead of being self-focused. He explained this kind of love means you treat your mate the way you treat God the Father and Son. He commanded this love be like the love He has for us — the love that led Him to the cross the day after He spoke these words. Do you want God’s blessing? Do you want a happy marriage? You now know the secret. What will you do with it? As Jesus said, Now that you know these things, you will be blessed if you do them. Many thanks to Dr. Henry Blackaby and Steve Pettitt for the contribution of their ideas to this Seeds for Growth.